NYC, 05/09/2019, 2:00PM. 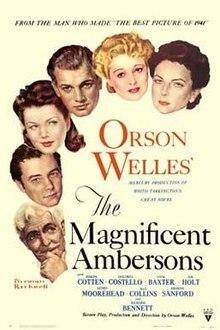 The Magnificent Ambersons by Orson Welles (1942): Four-Time Oscar Nominee. 88 min. Director: Orson Welles. Starring Tim Holt, Joseph Cotton, Dolores Costello. The Magnificent Ambersons is often regarded as among the best U.S. films ever made, a distinction it shares with Welles' first film, Citizen Kane. The film was nominated for four Academy Awards including Best Picture and it was added to the National Film Registry of the Library of Congress in 1991.